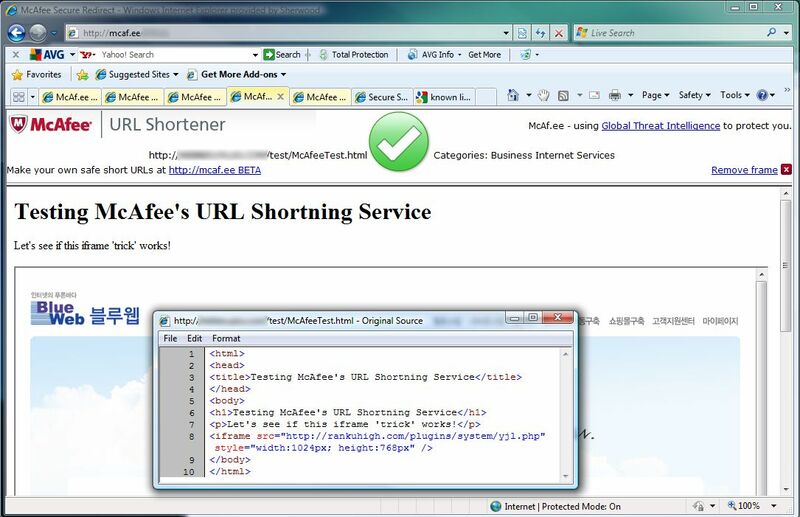 McAfee have launched a Beta URL shortening service with added security features. As Brett Hardin pointed out they are a little late to the game. However, there are so many abuses of URL shortening services that I commend them for trying. Basically, what their service does is allow you to create short easy URLs (like any other service). However, unlike other services, when you click on the link, it opens a frames page with the content in the bottom frame and the McAfee information in the top frame. This information includes details about the domain you are connecting to, the type of company it's registered to and a big green tick or red cross to tell you whether the site is safe or not. This is decided by their 'Global Threat Intelligence', which will block known bad URLs and phishing sites. That's good, if it works. I said above that I commend them for trying to provide this service. There are some obvious failings in their solution though, that render their protections useless other than to make it easier for people to phish users as the page has the McAfee stamp of approval. Below is their site working properly to block a known bad phishing URL. As you can see, this site was blocked and marked as a phishing URL, which it was. Excellent, it's working! Hold on a minute though. 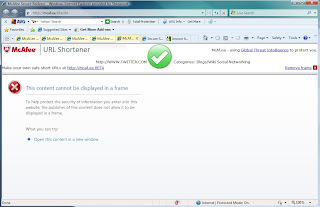 Have a look at the screenshot below where I can access the same URL through their service by embedding it in an iframe. I now get the big green tick and I'm told that it is safe. You can see from the source that the iframe is showing the exact same URL as was blocked before. Incidentally, the page says that the site is a Business Internet Services company, which is extremely misleading as I can assure you that this wasn't put on a domain run by a Business Internet Services company. Also, what about if I code my page to not accept being in a frames page? Then the service falls down again. 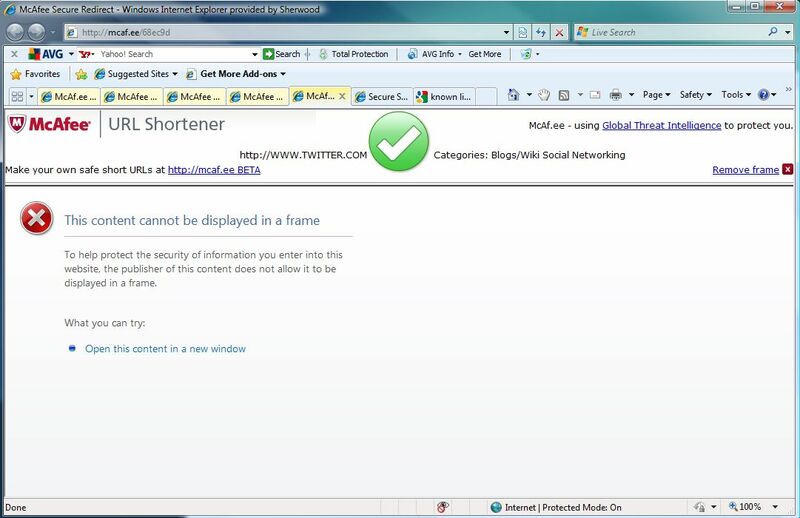 The screenshot below is of Twitter accessed through this service. 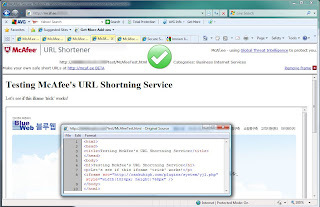 The problem is that I can hide all sorts of other links in the page to fool McAfee and the user won't see them. I know McAfee will block these URLs in time, but they will only be blocking the host page and they will have to block all of them. Also, if you click on a link within the page that directs you to another domain, then that is not checked, so I could just redirect you to a phishing URL and you'll still get the big green tick. It's a nice idea, but it just doesn't work. Interestingly, other services also have some security in them. TinyURL, for example, wouldn't allow me to create a short URL for this phishing site in the first place as it was recognised as such. 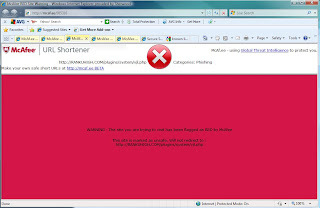 McAfee happily let me produce the short URL, they just blocked it later - not such a good strategy in my opinion. I know that a new phishing URL would fool TinyURL as well, but I particularly chose a URL that had been around for the best part of a month to give them a chance and I think TinyURL has done better. Incidentally, TinyURL also allowed me to produce a short URL for my test page. One good thing about TinyURL is the preview facility, but that doesn't protect me against a site that looks like the real thing. Moral: follow any links at your own risk and don't think that a green tick makes it safe!